In a career spanning close to fifty years (1967-2015), Todd Rundgren has distinguished himself as a performer, producer, and innovator of unquestioned genius in the field of rock music. He is the author of at least four songs, “Hello, It’s Me,” “I Saw the Light,” “Bang the Drum All Day,” and “We Gotta Get You a Woman,” that have become integral parts of the rock’n’roll canon and can be heard on radio stations all across the globe. His albums, approximating 25 in number and ranging from Runt released in 1970 to Global released in April of this year, comprise an eclectic and diverse set of recordings. As a producer, Rundgren during the 1970s and 1980s helmed commercial and groundbreaking works including Straight Up by Badfinger, We're An American Band by Grand Funk Railroad, Stage Fright by The Band, Bat Out of Hell by Meat Loaf, New York Dolls by New York Dolls, Skylarking by XTC, and Wave by Patti Smith. Not afraid of new technologies, the impresario embraced computers and video in a wholehearted fashion. Rundgren’s composition “Time Heals” became the second video to ever be played on MTV. Amassing computer skills at an extraordinary rate, he began programming his own devices in the late 1970s, spoke about developments and theories in the field before audiences as distinctive as Apple Computer, AutoDesk, Xerox, and NEC, and obtained fluency in an extensive range of complex and technical languages such as C, Java, HTML, Lingo, and MAX. Rundgren’s latest predilection—music education in public schools—grew out of a six-day residency he spent at Nottoway Plantation and Resort in Baton Rouge, Louisiana a couple of years ago. During his time there Rundgren witnessed firsthand the deleterious effects Hurricane Katrina had on the music community in New Orleans. This included the loss of instruments and funding for music education at city schools. Rundgren and his band of devoted followers decided something had to be done to combat the alarming decline in musical acumen and knowledge in a city known for being the birthplace of jazz and the home of many varied traditions associated with keeping a steady beat and rhythm. Hence, the Spirit of Harmony Foundation emerged as the vehicle whereby Rundgren relentlessly promoted music education for kids. One of the first significant events involving the organization occurred in Little Rock, Arkansas the weekend of April 17-19, 2015. Sponsored by the Clinton School of Public Service, a symposium entitled “The Moral Imperative of Music Education,” was held at the Statehouse Convention Center on Saturday night, April 18. Lasting three hours, it focused on the elements necessary to unlocking the benefits of a proper musical background and to making them play a key role in the development of school-age children. The factors in question would be classified as improved social interaction, better processing of information by the brain, substantial economic assets, and higher academic achievement. All of the speakers participating in the symposium made a compelling case for a curriculum grounded in music education at the public school level leading to a society with better citizens and a brighter future. The Spirit of Harmony Foundation, with Rundgren doing the honors, presented Bill Clinton with the Inaugural Singring Award for Music Education. He could not be there to accept the prize in person. Rundgren recalled Bill Clinton’s saxophone solo (Elvis Presley’s “Heartbreak Hotel”) on The Arsenio Hall Show in June 1992. 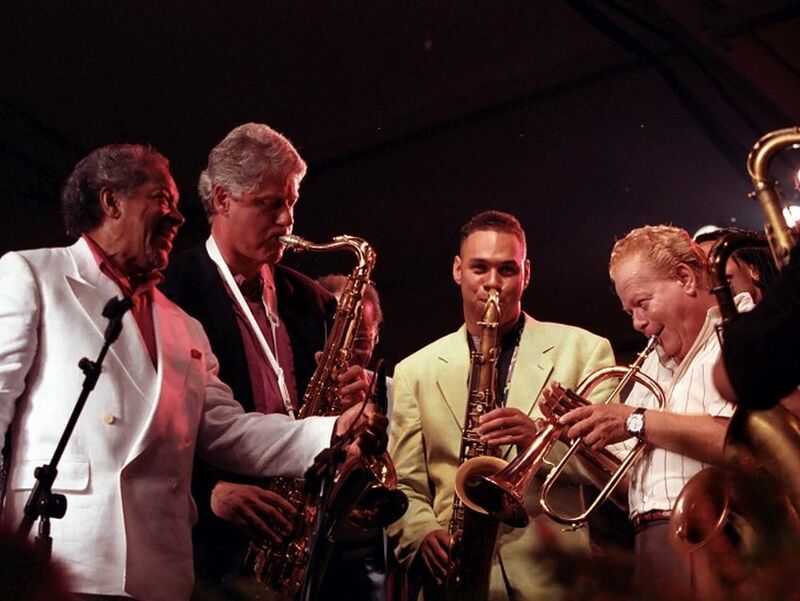 The rocker did say, in his opinion, the performance helped a then unknown Clinton gain much needed publicity and undoubtedly contributed mightily to the eventual victory of the former Arkansas governor in 1992. 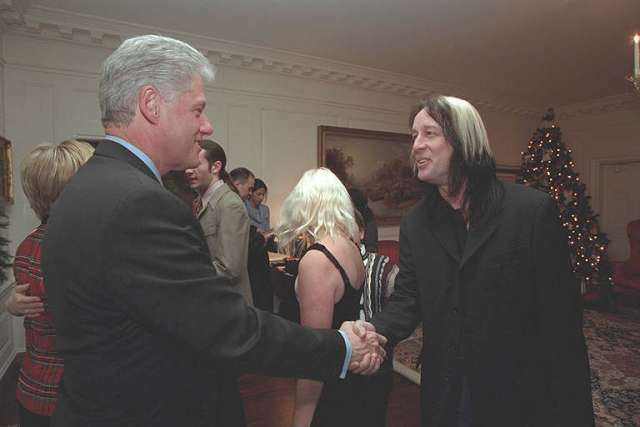 This photo shows President Clinton greeting Todd Rundgren at a Christmas Holiday reception at the White House on December 17, 2000.